Martin Rünk looks back at the Polymer Culture Factory, which was active at 22 Madara Street in Tallinn from 2002 to 2014. The Polymer Culture Factory, known as one of the most long-lived independent cultural centres in Estonia, closed its doors in late January 2014 after 12 years of activity. Leaving aside the settling of matters with the owner of the property, the end was not particularly dramatic. Polymer had been in crisis for some time already, and many thought it was high time to draw it to a conclusion and move on. Incidentally, the publication of the Polymer catalogue compiled by myself and Ernest Truely, who led Polymer's residency programme, happened to fall around the same time, adding a symbolic end to the whole project. At the busiest time of moving out of Polymer, Art Container, an art group and one of the most important tenants of the Culture Factory, opened their self-titled exhibition at Pärnu City Gallery, where the members of Art Container showed work from recent years, focusing mainly on installations. When I went to see the show the morning after the opening, the museum guard was complaining to a friend about how the people from Art Container had twice set off the fire alarm while working with a disc cutter in the process of putting up the exhibition, and demanded that the attic door be opened for the dove installation, dismissing the warning that then real pigeons might also fly into the exhibition hall. The guard was clearly disturbed by the chaos that so naturally comes with Art Container. Although they have travelled the world with their installations and performances, in my experience Art Container remain inseparable from the chaotic and uncontrollable environment of Polymer. The City Gallery housed in Pärnu town hall, on the other hand, is an environment in stark contrast to Polymer with an aesthetic that could presumably be seen as characteristic of Art Container. It was therefore all the more exciting to see what happens when such art has been removed from its natural habitat and placed in rooms where in the process of setting up the exhibition not even a single screw could be screwed into the walls. The result was surprisingly good. Large-scale interior installations are the absolute trademark of Art Container. These installations, built from found objects, are mostly quite labour-intensive and often also intended to create a performance space – like scenery for a theatrical production. Indeed, all the artists of Art Container have a very strong background in performance art, which to a larger or smaller extent is related to the legendary Non Grata art group. And to be sure, the first thing upon entering the exhibition, after seeing the white doves by Mai Sööt, was the installation "The Doors" (2011–2012) by Tanel Saar, Kilian Ochs, Sylvain Breton and Janno Bergmann. 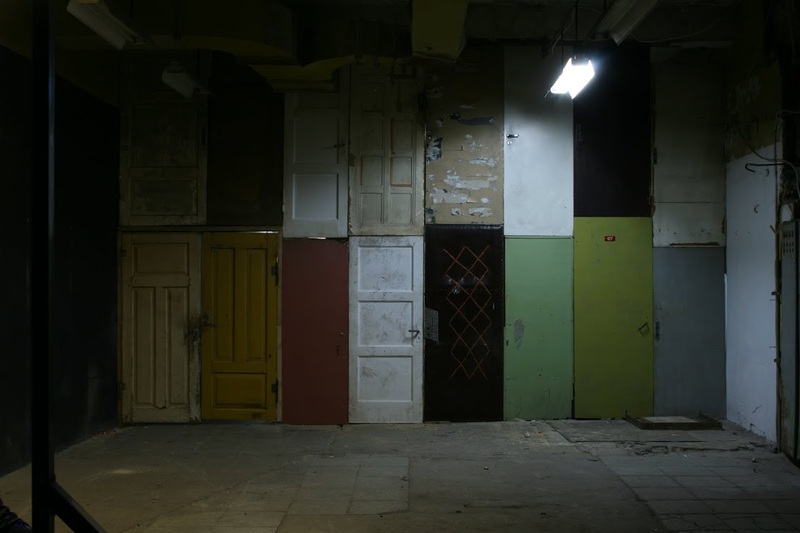 Consisting of doors found in Polymer and dedicated to the cult band of the same name, the installation has previously been shown at the independent art fair "SUPERMARKET" in Stockholm as well as at Polymer. The rock 'n' roll continued with Erik Alalooga's installation "Concert for Fermentation" (Kontsert fermentatsioonile, 2014), which was a wonderfully refined bubbling concert with bread fermenting in large tanks normally used for making home made wine. Alalooga, who for several years headed the recently closed department of performance art at the Estonian Academy of Arts, has for a long time now been interested in DIY musical instruments and given a number concerts on this theme in collaboration with, among others, Andrus Kallastu, as well as his own students. This time he had given up massive industrial qualities and instead sought sound in organic processes. In their randomness, the bubblings picked up by contact microphones made for meditative and absorbing listening. Functioning as a commemorative corner was the office of Art Container, brought over from Polymer, with a robust desk, statue of photographer Jaan Klõšeiko, key cabinet, bird cage and other objects. There was an on-screen video programme, part of which involved Tom Russotti and Ernest Truely's report on the notorious "Global Container VIII". A nostalgic Christian dimension was added to the exhibition by the work by the German artist Kilian Ochs. Titled after the opening sentence of Goethe's "Faust", "Revealed, as once you were, to clouded vision" (2013) at first sight appeared to be a rather ordinary installation with projections of slides from grandmother's photo album, but a more careful inspection brought the pictures to life, and upon leaving, one felt an uneasiness about the past. There were spirits, who inexplicably made themselves known with a little restless rustling and refused to consign themselves to the past. Another work was "Resurrection" (2013), where the artist had restored the circuit board of a broken cassette player as a sculptural, even architectural form. The cassette was playing a monotonous sound. Something that was, figuratively speaking, dead had found a new, elevated life. Sandra Jõgeva's recordings of stand-up tragedies were the most documentary and directly performance-related pieces in an otherwise rather object-centred show. Art Container came into being in spring 2007 and the first exhibition, "New Wave: 21st Century Estonian Art" (Uus laine. 21. sajandi Eesti kunst") was held at the same time that the Bronze Night riots broke out. This was enough to create the mood – chaotic, devil-may-care with a touch of anger. One should not rake up the past, but Art Container was originally called NG Art Container and represented Non Grata in Tallinn. Back then, Non Grata were short-circuiting people's brains with their image campaigns, whose goal was to develop a legend of a community of equals in their anonymity, where the insignificant become princes. This seemingly demagogical device inspired endless discussions on whether or not Non Grata were intentionally manipulating the art audience. Which, of course, was not important at all. What was important was why they were constructing this particular myth. In 2009, they went their separate paths and what remained of Non Grata in Art Container was only the slogan "an alternative point of view". With Art Container, it is interesting to observe how out of one phenomenon that is so forceful another has grown, and how the values of the first have lived on and transformed. The aspiration towards a collective entity is a controversial phenomenon because in fact no collective actually exists but rather a modus operandi based on equality and a lack of hierarchy. Anonymity is the concealment of actual power relations and allows individual contributions to be effaced. That way people can be forgotten and erased from the scene. An idealistic belief in equality can only exist during some initial period of innocence, but ultimately power games will come in. In contrast to NG, Art Container's ideology is not as loud and declarative. There's piles of attitude, however. They are very bad! Out of the Art Container trio, Erik Alalooga is slightly bad, Tanel Saar is fairly bad and Sandra Jõgeva is particularly bad. In the new Polymer catalogue, Ernest Truely warns visiting artists of a lack of compassion at Polymer: "No compassion!" True, this was something that was absent from the place; there was a struggle for survival, a hardening amidst the environment and human relations. The ones who went through this harsh process had learned something and experienced reality in hyperbole. Art Container had a powerful symbiosis with Polymer, where a crumbling environment, and one that was not particularly friendly towards the tenants, produced an attitude based on the same logic that makes Estonian people so angry and wrinkle-nosed. How can you be accommodating to others when the weather is constantly so depressingly grim? One of the most symbolist works at the Art Container exhibition in Pärnu is the installation "Kingdom of Heaven" (Janno Bergmann, Tanel Saar, Kilian Ochs, 2013), where sagging crosses glued together from paper envelopes rise up as they are inflated at the triggering of a motion sensor. A year ago, at the "Sicht/Beton/Ung" festival in Dresden it certainly had a more open meaning, but this time it led one's thoughts much more to current events. The contract between the non-profit association Polymer Culture Factory and Baltic Real Estate Management has been terminated. Art Container has vacated the premises of the former rubber factory along with many other tenants. At the same time, many stayed on, with activity and decadence continuing in an even more uncontrollable way. What will come of Art Container is unknown even to those involved. In the meantime, until things settle, one may leaf through the catalogue, read Sandra Jõgeva's blog chronicle and look at pictures on the side. "Perhaps it is actually good that Polymer was shut down. The Art Container people made great art there for almost a decade, but that is where it remained in terms of mentality, between the factory walls. If one were to go through the CVs of the participating artists, it would, of course, turn out that all of them have also performed elsewhere. Joint tours have taken the group to the US and Australia, not to mention places closer to home. Sandra Jõgeva is a well-known figure in her own right, but how widely her art is known is another matter. Mai Sööt is visible on the dance scene. Erik Alalooga and his student band Postinstrumentum test the limits of the world of theatre and music. Janno Bergmann has regularly performed in Russia and Pärnu, Kilian Ochs, also, in his hometown of Karlsruhe and Istanbul. But seen from the mainstream point of view in the Estonian art scene, all these performances have been to completely remote corners, precisely like the dark and dusty hallways of the old factory building. Now that the factory has closed, there will at least be a theoretical possibility of encountering the work of the artists of Art Container at "respectable" venues and art events, for where else is there left for them to go? Whether this will materialise in practice is another matter and it depends largely on the future choices of the artists." Mari Kartau, Artcontaineri Suur Kunst. – kultuur.err.ee 16. II 2014.